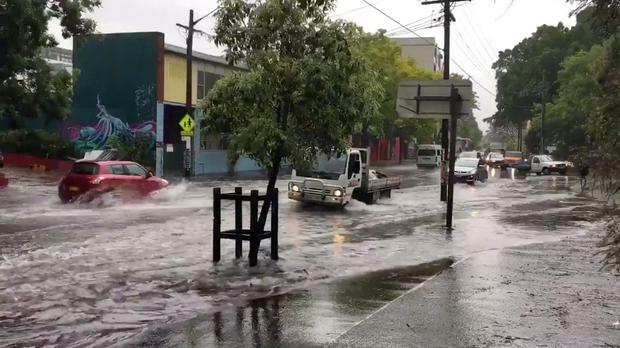 Vehicles drive on a flooded street in Sydney, New South Wales, Australia November 28, 2018 in this still image taken from a video obtained from social media. @DeeCee451/via REUTERS THIS IMAGE HAS BEEN SUPPLIED BY A THIRD PARTY. MANDATORY CREDIT. NO RESALES. NO ARCHIVES. Torrential rain and gale force winds lashed Australia's biggest city of Sydney on Wednesday causing commuter chaos, flooding streets, railway stations and homes, grounding flights and leaving hundreds of people without electricity. Police called on motorists to stay off the roads. One person was killed in a car crash and two police seriously injured when a tree fell on them as they helped a stranded driver. A Qantas plane takes off during heavy rains in Sydney, New South Wales, Australia November 28, 2018 in this still image taken from a video obtained from social media. Adem Yaglipnar/via REUTERS THIS IMAGE HAS BEEN SUPPLIED BY A THIRD PARTY. MANDATORY CREDIT. NO RESALES. NO ARCHIVES. Greg Transell, an office manager in Sydney's north, told the Australian Broadcasting Corporation that strong winds caused widespread disruption to the tower block office where he works. "I started to go upstairs to see if there was any damage and next minute there was an almighty bang and it ripped panels off the roof in the warehouse," said Transell. Australia's Bureau of Meteorology (BOM) Sydney got more than 100 mm of rain in just a few hours, a level that the country's most populous city would normally get through the whole of November. "That’s the sort of rainfall you’d expect to see once every 100 years," said Ann Farrell, the bureau's state manager, told reporters. The rain offered a welcomed respite to farmers ho have suffered through a sustained drought in recent months, but it caused major disruptions to transport. Sydney airport, the country's busiest, said 130 flights had been cancelled or delayed after it was forced to close two of its three runways. "The storm is pretty intense in and around the airport," Cait Kyann, an airport spokeswoman, told Reuters. "We are operating from a single runway so that means that there are delays and likely some flights will be cancelled." Ausgrid, the nation's biggest electricity network, said the storm had cut power to 8,100 customers in Sydney and the Central Coast area to its north. The storm struck only hours before the main morning peak hour, transforming some streets into fast-flowing rivers and parks into lakes. Several stranded motorists were plucked from rising floodwaters. "We are asking all road users to reconsider the need to be on the roads throughout what will be a severe rain event," said New South Wales state Assistant Police Commissioner Michael Corboy. In contrast, in Australia's northern state of Queensland, soaring temperatures near 40 degrees Celsius (104 Fahrenheit) and strong winds exacerbated major bushfires. Firefighters have been battling for nearly a week to contain more than 130 fires across Queensland, and 8,000 people were ordered to evacuate the city of Gracemere, about 600 km (370 miles) north of the state capital, Brisbane. "These are unprecedented conditions," said state premier Annastacia Palaszczuk. "We have not seen the likes of this."